Shimonoseki is located in Yamaguchi Prefecture, just west of Hiroshima. Although the trip from Tokyo takes nearly five hours on the shinkansen, the deep history and unique culture of Yamaguchi make it more than worth the effort. If you want to make the most of your trip to Yamaguchi, these 10 spots can help, courtesy of our friends at Trip101! In 1185, during the battle of Dan-no-Ura, legends say that Emperor Antoku (then only 7 years old) was plunged into the Kanmon Kaikyo Straits and drowned by his grandmother to prevent him from being captured by the enemies. The Akama Shrine saw the end of the Taira Clan in 1185, and serves as a reminder of a pivotal turning point in ancient Japan’s history. 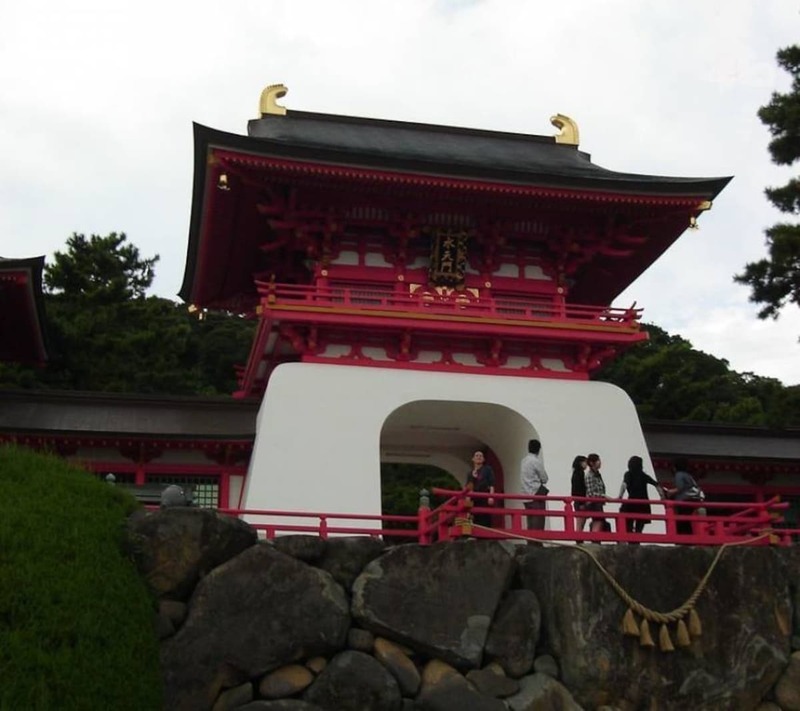 At the Akama Shrine, not only will you be able to learn about such history of Japan, you will also be able to explore the complexes that served the people for hundreds of years. Furthermore, you can view the area where Emperor Antoku was said to be drowned. This place today serves as a power spot for family health, water safety and more. Akama Shrine is definitely worth a visit for those who love Japanese history, too. Shimonoseki was a gateway between Japan and the rest of Asia, and was an important port and trade hub. A British Consulate was built in Shimonoseki in 1906. At the Shimonoseki Former British Consulate—a beautiful building with striking red bricks—you can learn about the shared history of Japan and the U.K., and view various artifacts on display. The Shimonoseki Former British Consulate is located near the Karato Market, so you definitely won’t have to worry about being hungry either! The Chofu region is just 20 minutes from Shimonoseki Station by bus, and is an old-style Japanese street known for its quaint atmosphere. You can walk along the river of Chofu and visit the Jokamachi Chofu Museum, where you can learn about the history of Shimonoseki. Apart from that, there are various old buildings and artifacts around the region that you can explore. The Chofu region is a must-visit for those who love Japanese history! In 1612, there was a duel between Miyamoto Musashi and Sasaki Kojiro, two of the most famous swordsmen throughout Japan, at Ganryujima Island. This duel is today known as the Ganryujima no Kessen, or “Battle of Ganryujima” in English. The island has a statue that depicts the fateful duel between the two. Access to Ganryujima is via a 10-minute boat ride from Karato Port. Tsunoshima is a small island located offshore Shimonoseki, and is connected to the main island by a 1,780-meter (about 1.1 mile) bridge—the Tsunoshima Ohashi. 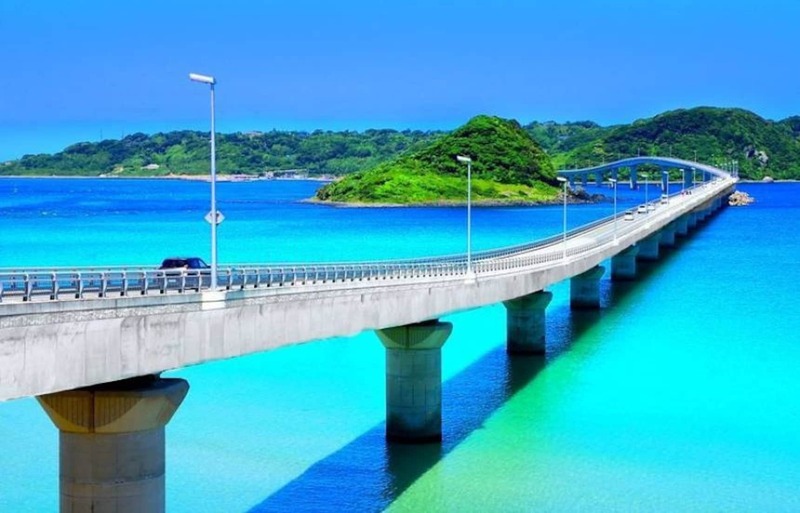 It is highly recommended that you visit Tsunoshima by car—not only is it more convenient, it is also a great feeling to drive across the bridge while admiring the amazing view of the Sea of Japan! The island is surrounded by an amazing emerald green sea and has beautiful fine, white sand beaches. Selected as the most beautiful bridge in Japan by the 2015 TripAdvisor rankings, Tsunoshima cannot be missed when you are visiting Shimonoseki! Kaikyo Yume Tower was built in 1996 as a landmark of the Kanmon Kaikyo, and has since been regarded by tourists and locals as the symbol of Shimonoseki. A 360-degree panoramic view of Shimonoseki and the nature surrounding it can be appreciated from the 143-meter (about 469 feet) high observatory deck. It is especially recommended to visit Kaikyo Yume Tower at night when it's illuminated. The fantastic night view of Shimonoseki provides a romantic atmosphere and is the perfect spot for a date! For the other incredible entries on the list, check out the original article from Trip101 at the link below.